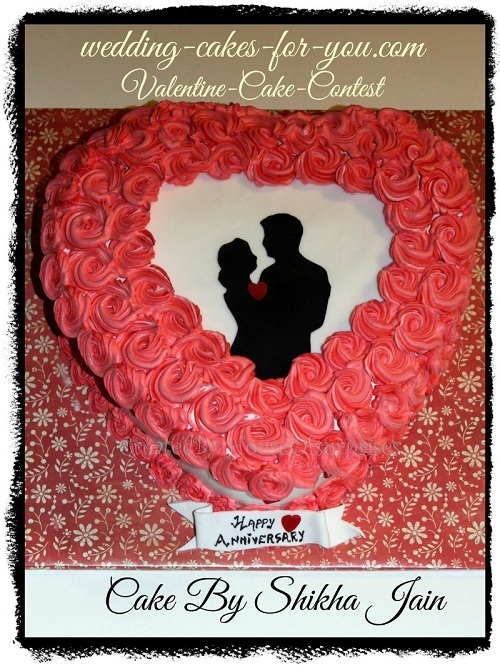 Beautiful valentine cakes made by various cake artists are featured below to help spark ideas and inspiration. 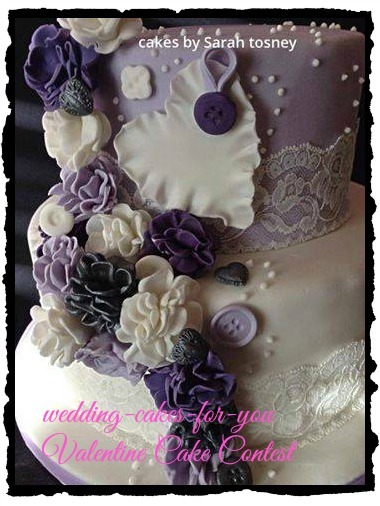 This cake is featured at Wedding Chicks :-) One of the top wedding blogs in the world. Check out the article. Click the pic! As you may know already this website is all about sharing. 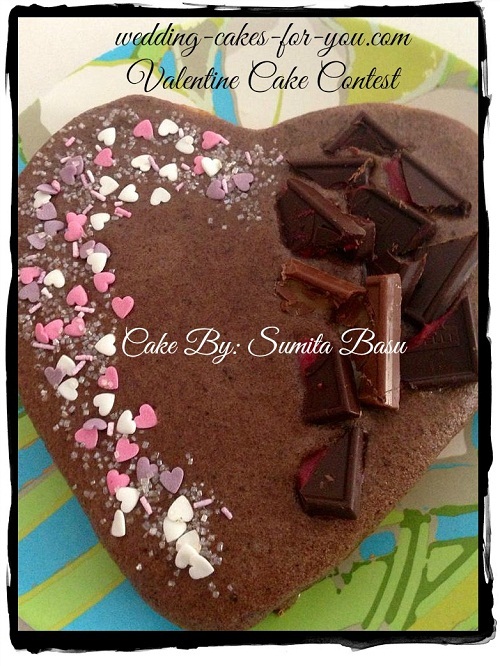 So here are some beautiful confectionary delights to savor with your eyes from some of my cake friends. Yellow cake filled with buttercream, covered with fondant and a gum paste bow, with chocolate candies inside. 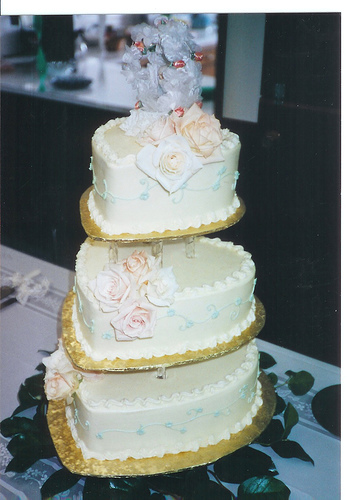 An example of a small blue wedding cake with royal icing cornelli lace designs around the top edges. 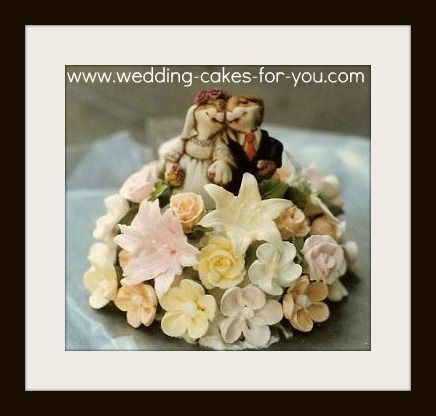 The flowers are handmade of gum paste. 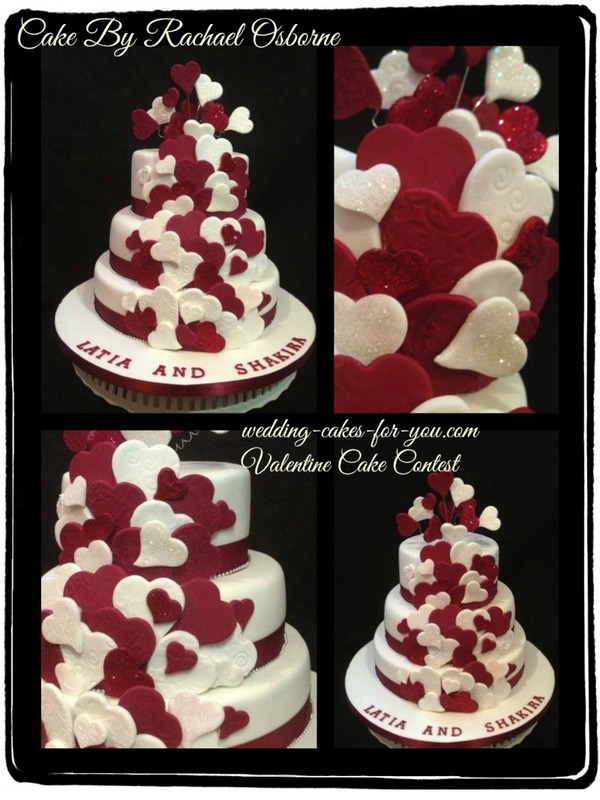 The small 6 inch heart (right) is a sweet old fashioned buttercream design that can be adapted to a wedding cake. I made this for a friend as a Valentine gift. It is a carrot with lemon cream cheese icing. 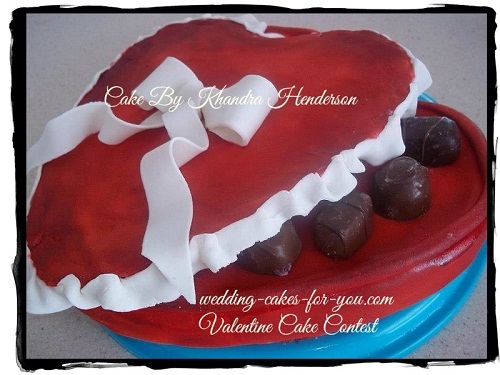 The video shows a heart cake from start to finish using the BEST carrot cake recipe on this website. Enjoy! The recipe is in the video but you can also see it here on the website. The link to this fabulous carrot cake is at the bottom of the page. 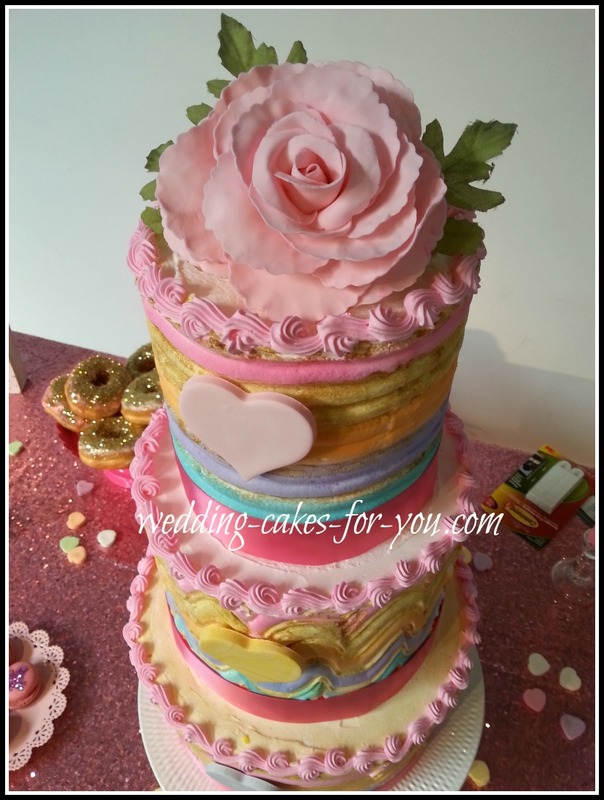 A small three tiered heart shaped wedding cake romantic design like this is perfect for a guest list of 50 if the bride and groom keep the top. Saving the top of the cake for the first anniversary is traditional. Some recipes will stay fresh longer well wrapped in the freezer for a year. For example, the carrot cake and the chocolate buttermilk. This big beautiful cake has three heart shaped wedding cakes and was created baked and decorated for my sister and brother in law. Lori and Johns cake was a carrot with cream cheese filling topped with a very unique topper. A close up of the the original topper on Lori and John's beautiful masterpiece. 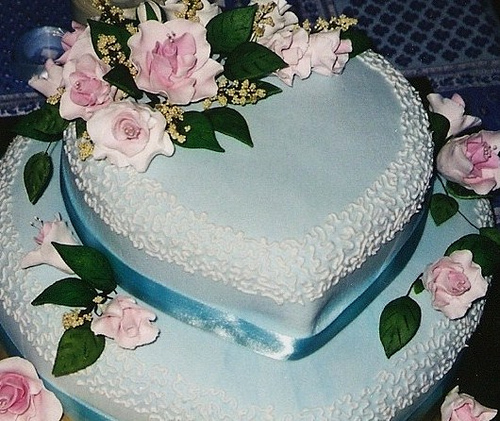 (above) You can see the detail of the royal icing flowers in this photograph. 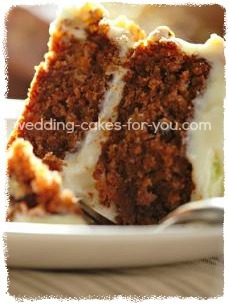 The go to carrot cake for all occasions. Beautiful cookies to make for favors and parties.